Established in 2007, S J Ryan Groundworks is a small family run business based in Horley, next to Gatwick airport offering a wide range of services to suit your landscaping needs. We are proud to say that we provide a polite, friendly, reliable service. All of our work is carried out to the highest of standards in a cost effective way, using a small but experienced team of tradesman. 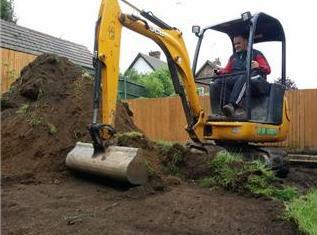 We provide many different Hard landscaping services such as Driveways, Paths, Patios, turfing, Concrete bases, Concrete Footings, Operated Mini Digger Hire, Brickwork, Extensions, Drainage, Fencing, Decking & Pergolas. All of our work is covered by a 5 year workmanship guarantee. If you would like a good quality, value for money project carried out then look no further.